Description: This creek traverses a mile and a half of willow dotted meadow and has an amazingly varied habitat ideal for trout. A textbook creek with pools, riffles, flats, cutbanks, runs and pocket water. 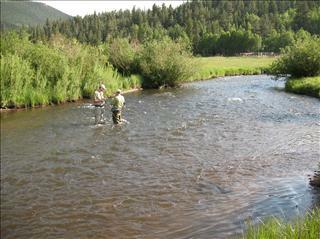 Browns and rainbows from 8 to 12 inches with larger trout in the prime lies. There are also some big pike waiting for your 8-weight and streamers. Location: A-10 is 4 miles downstream of our A-8 property and approximately 6.5 miles below Tarryall Reservoir or 22.5 miles on CR 77 from Jefferson. From Lake George on CR 77 the property is approximately 25 miles. Capacity: 3 anglers or 2 groups of 2 each.